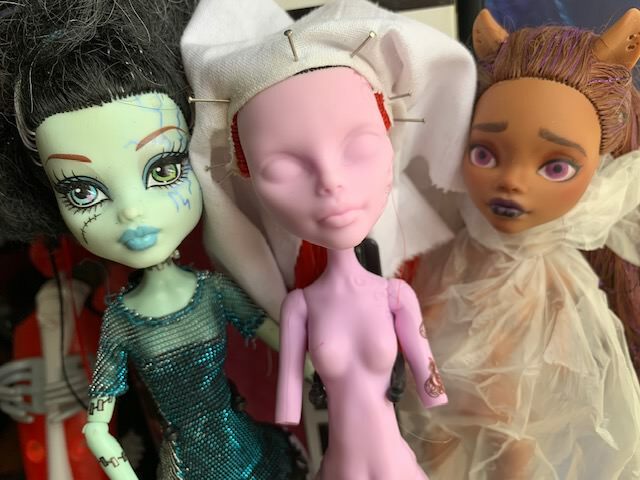 I need to work on Rochelle and Clawdeen and finish them up, and figure out how to make a wig cap for their odd heads, but RL is getting in the way. Hopefully soon! So the stars have aligned and I have a room of my very own, I got my craft corner set up (for the most part), and not a moment too soon because I reeeaaalllly wanted to make some dolls for Halloween, and try my hand at filming the process for YouTube. That's right, I said dolls! I'm hoping to get a set of three done and have videos uploaded for each by the end of the month. It's certainly a challenge for me, I've only made three dolls ever, but I'm feeling pretty confident! To start, these are the three base dolls. If you already follow me on Instagram, you've likely seen most of these pictures already. As much as I like how Clawdeen was turning out (I'm still really proud of those brows! ), I admittedly lost inspiration for her, so she'll be put to better use for this project. 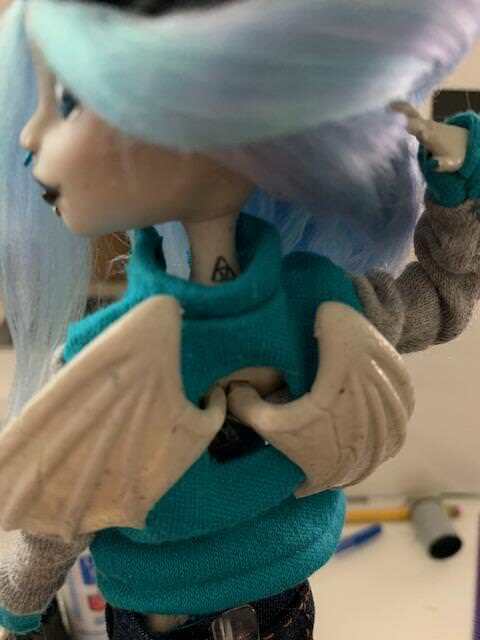 Perhaps I'll "remake" it in the future when I'm better able to start and finish a doll in a reasonable amount of time. This is the first one I started on, and she's been a problem from the beginning. 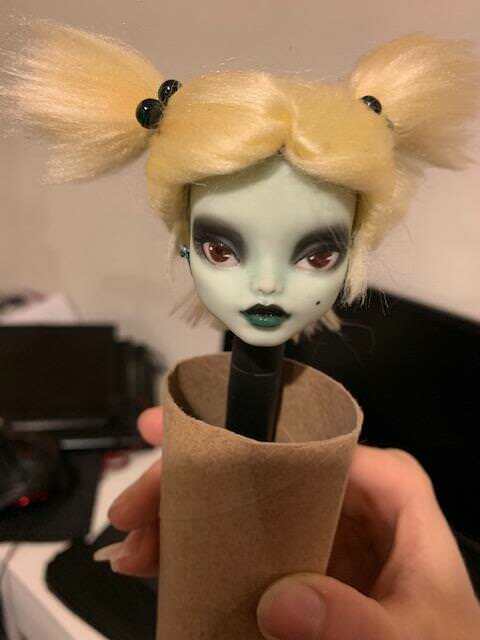 I did want a pink doll for the base and initially planned on using a Draculaura, but the face was much rounder than my reference, and I hesitated on using a Ghoulia and forgoing the pink skin, but then remembered lovely Operetta, whose face I had already wiped back when I was living in Sweden. 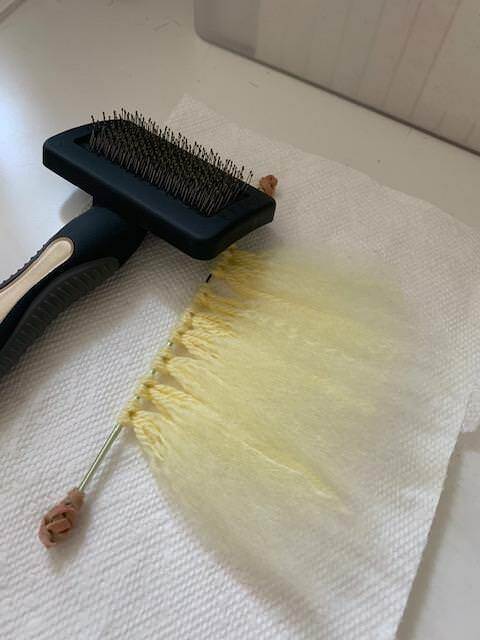 I had seen Andreja/NicollesDreams highly recommend a nail rotary tool, claiming that at $8 it was far superior to her more expensive Dremel. I got my roommate to use his Amazon Prime account on me, ordered one for myself, opting for Same Day Pickup (the benefits of San Jose!) and...it got delayed. For two days. I finally picked it up yesterday, went to use it, and it did nothing. I was so disappointed! I asked my roommate to start a return for me, and he told me he had already ordered me a proper Dremel; after seeing what I ordered, he didn't think it would work, and decided to be super duper nice and place an order yesterday. So that's (hopefully!) showing up tomorrow, and I can start getting rid of those lovely scars. While I was waiting for the initial rotary tool to arrive, I started working on the hair. I wanted to do a deep red, almost black, but couldn't find any yarn that matched what I wanted, so just decided to go with black. First I glued the first part weft on facing the wrong way, managed to flip it before it dried. Then I forgot to clip the weft before adding the opposite part weft, so the two got tangled up, and it dried before I realized my mistake. Once I finally separated them to their proper sides, I noticed there was a large gap in the scalp between the two wefts. I was incredibly frustrated and disheartened at this point, but then got the idea to put red pastels on the outer wefts to give it that red shine. I ended up forcibly removing the glued-on wefts, using them in lower layers where any messiness would be hidden, and made new, colored wefts for the part, and it turned out so beautiful! But also so so so incredibly messy! And my cats keep jumping on my desk and walking in the red powder! It's faded a lot from what that picture looks like, which hopefully means it's done transferring color everywhere, but learn from me and always cover your dolls in plastic wrap! 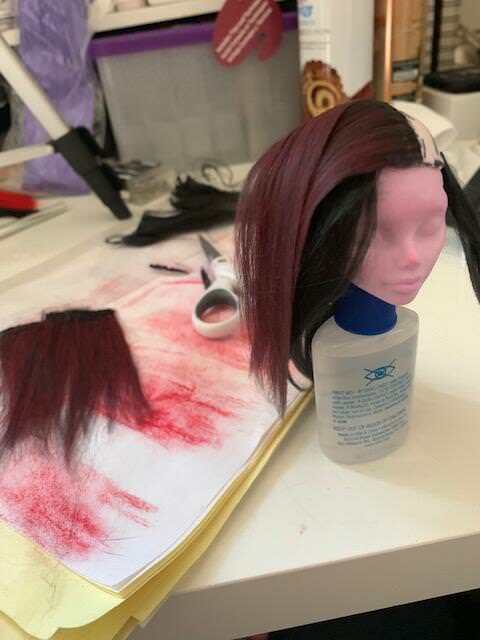 Poor Operetta is going on three acetone baths at this point, but at least the hair is just about done, only have to tame it and trim the bangs a bit. Started working a bit on the second doll since I can't make much more progress on Operetta until tomorrow. 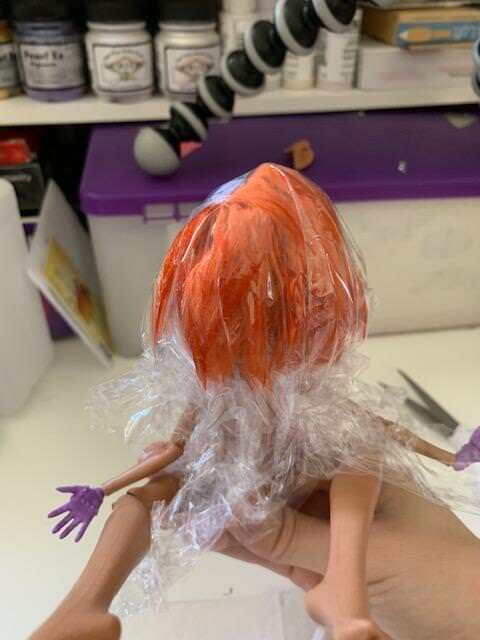 Her face is wiped, her hair is cut, and she's currently drying from her first MSC layer, so I began working on removing her scars as well (Isn't it odd that we love Monster High dolls for their freaky flaws, but as customizers, tend to remove them?). 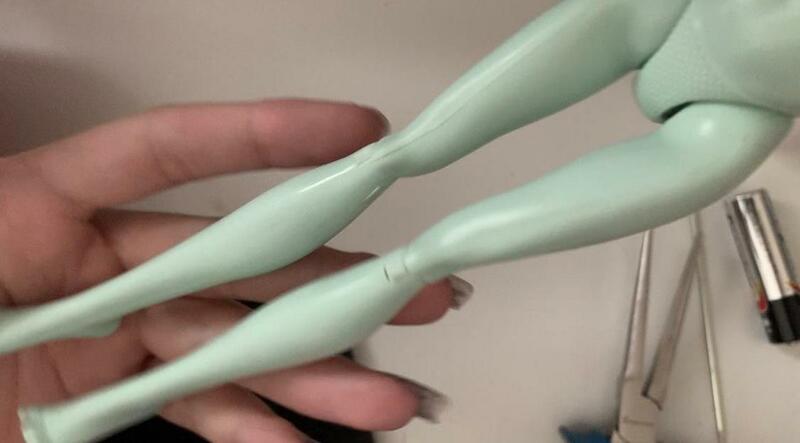 I know not to use acetone on the bodies, as it can melt the plastic, but in my infinite wisdom, I decided that I could wipe the paint off with acetone and then immediately wash it in a bowl of warm soapy water. And it worked! Until I dried the body off and got a look at it. 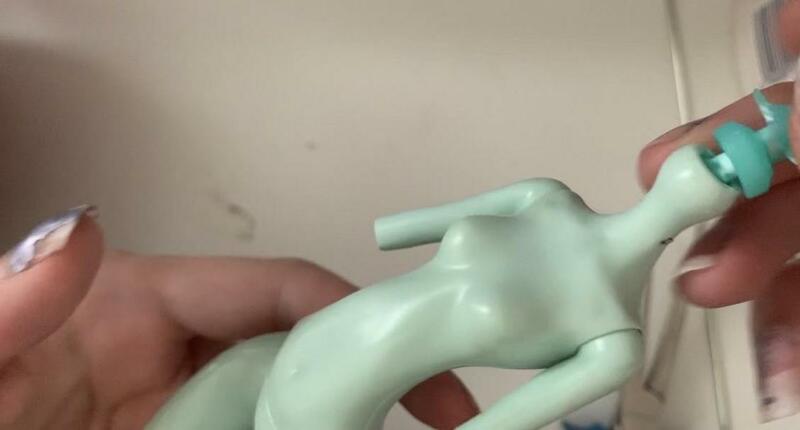 It hadn't melted exactly, but there was definitely something wrong, like if you had taken the doll outside and dragged it on concrete for a while (my trunk yeeted my hand vacuum during a move and the plastic on it is now super scuffed up, so that's where the frame of reference is from). I had a large sanding block, which I used to take off the last two stitch-scars that were remaining, then cleaned up the whole body with a 4 way nail block, and I couldn't be more pleased with the results! So learn from me again, don't mix acetone with plastic, even if you think it's so small/quick that it won't do any harm. It will! And here's where I'm at right now. 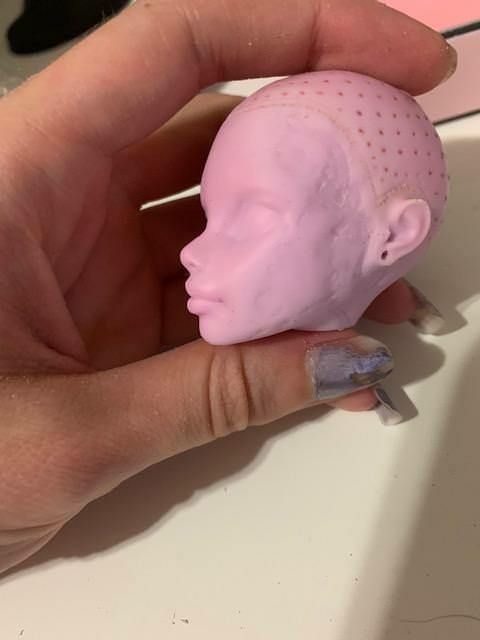 I made a wig cap for Frankie's size head (it's resting on Operetta right now as Frankie's dries, and it's significantly larger on her!) and I'm working on some slightly shorter blonde wefts for her new look. She's going to get some short pigtails, and I think this should be long enough. I didn't want to make "full size" wefts and cut half of them off, but on the flip side, I hope I didn't make these too short, since I won't know until they're glued on! So that's the progress for now, and I think Frankie's due for another spray. 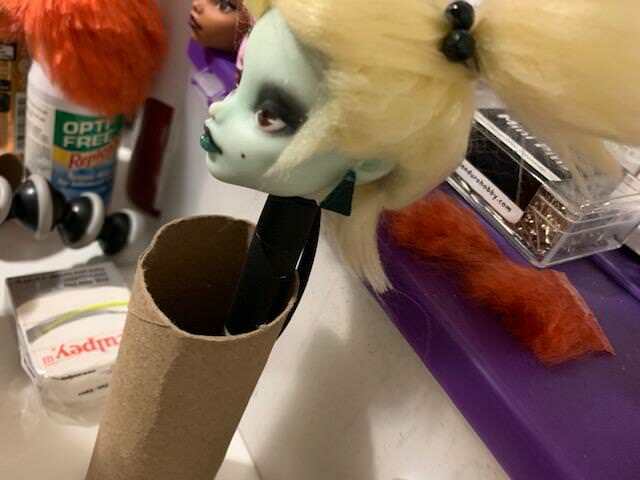 I might start on her face today, even though the plan was Operetta, then Frankie, then Clawdeen (maybe deep down I'm hoping that I find another Clawdeen lurking around in bad shape so I don't have to wipe the one I spent so much time on?). 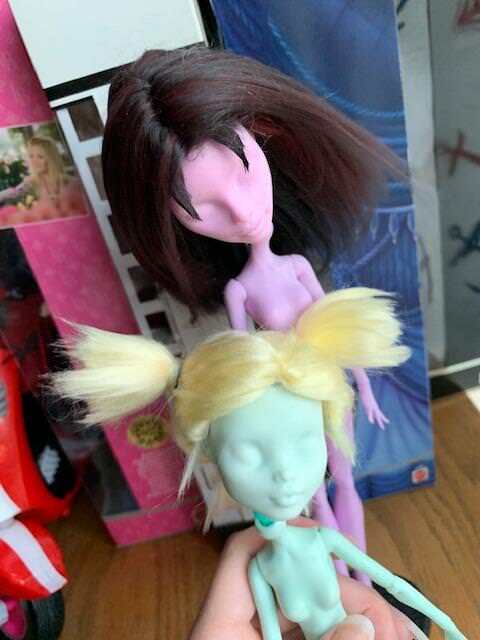 Anyone have any idea who these dolls are going to turn out as? No idea who they'll become, but I look forward to finding out! Nice start! And thanks for the 'kids don't try this at home' advice! Operetta post-Dremel. I'm not super happy with how it turned out, I need a lot more practice, but I did a bit more and got some sandpaper to smooth it out a bit more after this picture. It isn't perfect but it's hopefully not going to be super noticeable, especially with the wig on. They need a tad bit more styling, but these two wigs are pretty much done! Started on the third wig, it's gonna be pretty poofy and I'm hoping I can make it work. I didn't straighten the wefts, so it's all just brushed out yarn with no heat, I'm hoping it works in my favor but it's tricky! 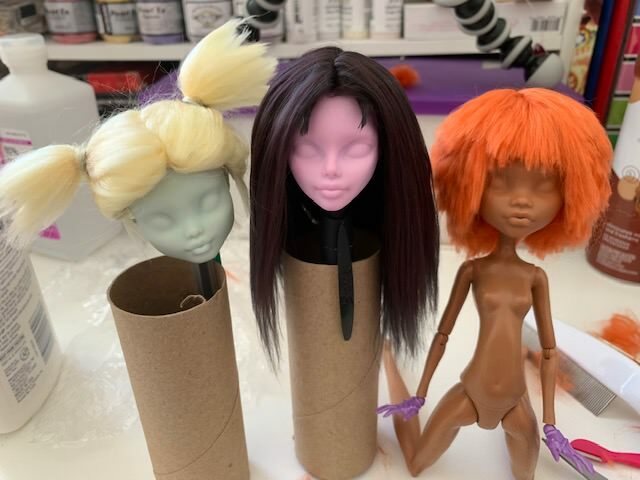 All three wigs finished, barring minor touchups. Hopefully it's easier to determine who they're supposed to be now. I'm most proud of the orange one! Pleasantly surprised with how nice it turned out without straightening the wefts and manipulating the yarn for volume. After work today (or if it's slow enough during) I'm going to clean my craft desk up a lot and see about getting a better filming setup for when I start the faces tonight. For now, Clawdeen's getting her MSC treatment! Are they the Hex Girls?! I was kinda thinking that as I made it! You got it! I'm glad someone recognized them! I wanted to keep it kind of pale and not add blush or anything, but looking at the picture I can see that contouring with a bit of green will really help. Will have to add that on the next layer, as well as darken the eyes. 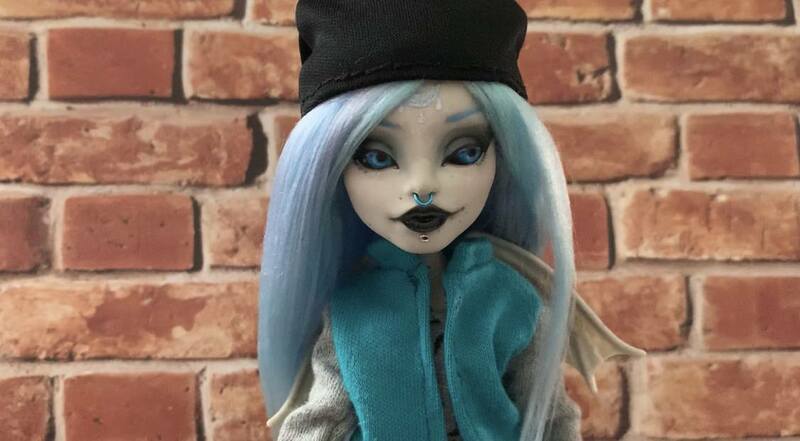 She and Luna have black eyes but I'm probably going to make them brown; unfortunately this light brown I used as a base turned out really orange and I'm not liking it. I'm not a huge fan of the "no eyebrow" look, but I'm also not a fan of drawing eyebrows, so I guess it kinda works out. Ha, the Hex Girls, that is seriously so awesome! And Dusk is effectively done! Made her some little earrings, which were a pain. Colors aren't sticking super well to Luna's lips or Thorn's eyes, so I may need to switch to paints for those. Only paints I used on Dusk were the liner and catchlights, and only because it was blending in with the black pastels. IMO it still looks really soft, not sure what I'm doing wrong to not get bold lines. Oh well, still very happy with her! I just wish her wig fit a little better, I might be able to fiddle with it a bit more to get it just right though. Just about done! 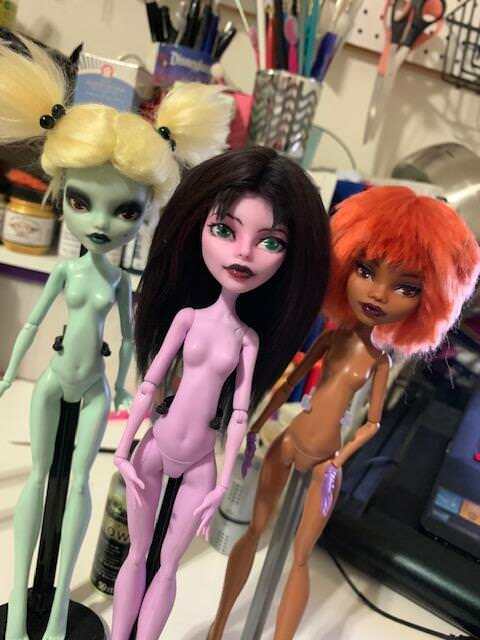 Wanting to add a few last touches to them, then see if I can make their clothes before the end of the month. Excited!!! Oooo! They are coming along so nicely! Thank you for the support everyone! I wont be able to get the clothes done by the end of the month unfortunately, but I did at least finish the small accessories I wanted to do. For the time being, they're complete! If you're at all interested in the process, I'm trying to start a Youtube channel for my repaints, and kicking it off with this project. I've only just finished Dusk's video, and I'll have to really work hard to get the other two done by Halloween. Wish me luck! Our internet kept going out and we finally found out we have a rodent problem, and they keep chewing up our cables, so it took forever to get to a location where I could get the videos uploaded. I'm staggering them today, Thorn is up now and Luna is scheduled for 6:15 PT if I remember correctly. I won't have wi-fi until at least Nov 1st, but I hope you enjoy the videos in my absence! Working on my next project, which is going to be a Christmas gift for a friend! Did my first reroot and I'm pleased with how nice the yarn turned out. 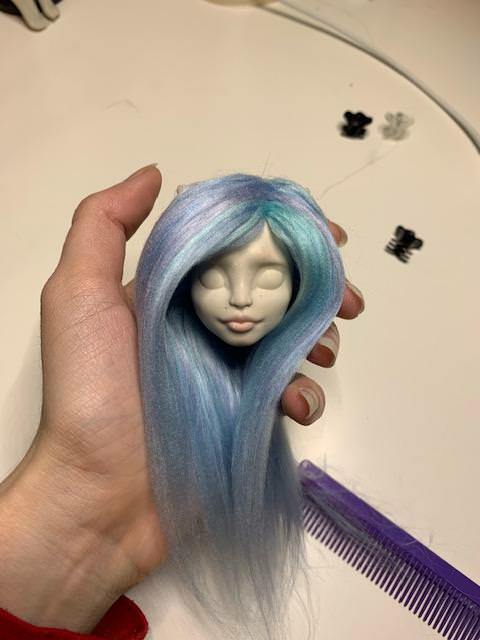 Just looking at the hair gives me pastel goth vibes, but I'm not sure what I want to do with the doll's face; I'll have to look through their aesthetic stuff and come up with something. I'm open to suggestions as well! 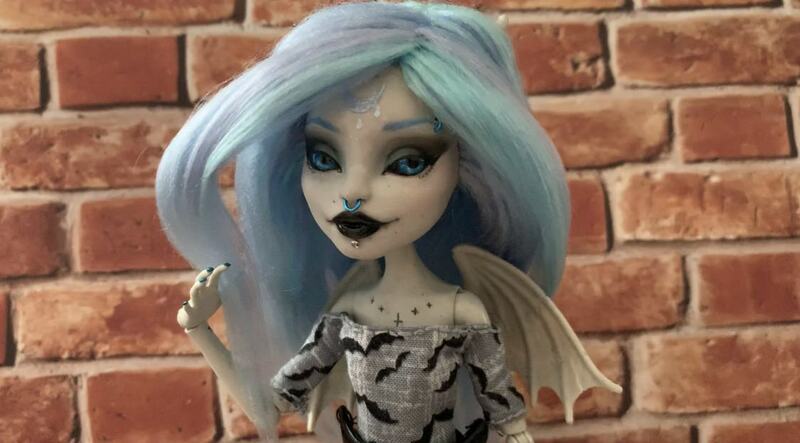 I'm probably going to give her black lips, and I'd like to incorporate teal (eye color or eye makeup maybe?) but not sure on anything else. 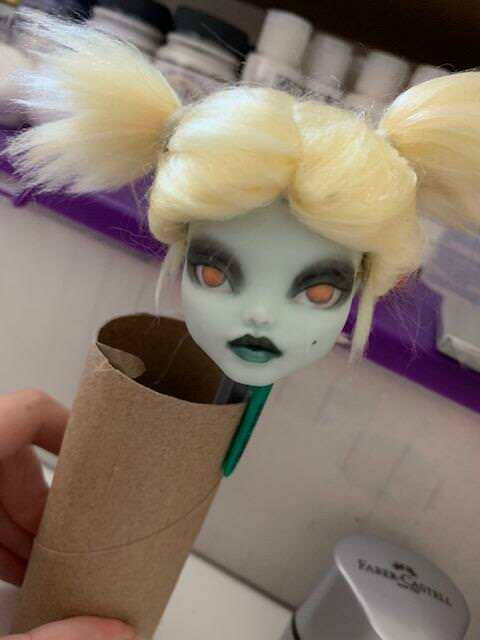 Blacked out scleras, a third eye on the forehead, something creepy and cute! Wow! I’m loving the blue wig. Great job on all of these! 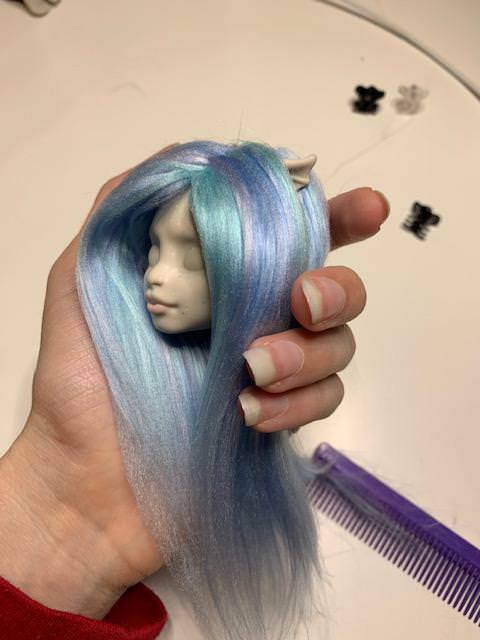 I forgot to update this thread with the finished doll; it's currently in the mail and arriving tomorrow, so I'm very excited to watch my friend open it on video call. Live reactions are the best! I need to work on the video, editing is such a pain though! I'll post the video here once it's all finished and uploaded.